The heavily rumoured HTC Desire HD has appeared via online retailer Amazon UK as the hotly tipped and eagerly awaited follow up to the HTC Desire gets given a rather friendly £415 price tag. 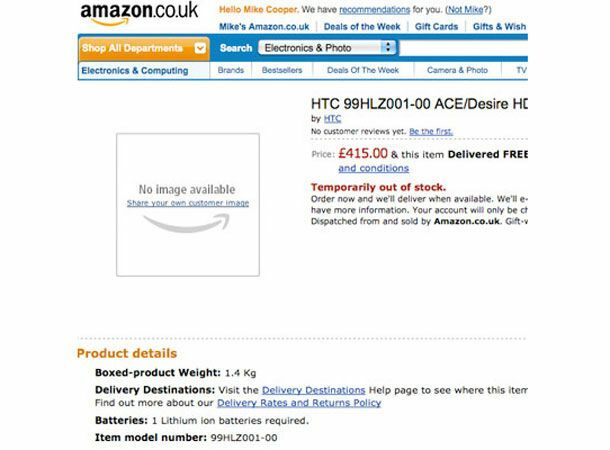 Before it was hastily removed the HTC Desire HD briefly appeared on the Amazon UK website listed as the HTC 99HLZ001-00 ACE/Desire HD. Whilst an official launch date and full specifications of the elusive HD have yet to be revealed, this fleeting appearance would seem fitting with the widely accepted expectation that the new HTC handset will be unveiling during the company's mystery September event. First spotted on the inventory systems of Vodafone Germany the HTC Desire HD looks set to build on the phenomenal success of the original HTC Desire when it is officially launched. Expected to run Android 2.2 FroYo or even the upcoming Gingerbread 3.0 edition of the Google OS, the Desire HD has also been rumoured to fall under the title HTC HD Ace. Whilst this leak on the Amazon website appears a very exciting insight to the new device, the handset's £415 price tag seems slightly too good to be true. Elaborate hoax or genuine leak? Let us know what you think of the Desire HD's appearance on Amazon UK and follow all the latest breaking news on the HTC handset via the T3 Twitter and Facebook feeds.